It scared the crap outta me upon reading an article online regarding a bomb found in Puerto Princesa specifically at Sabang wharf, the jump-off point of tourists visiting the famous Underground River. As a person who hails from a peaceful city of Puerto Princesa, news like this is difficult to digest. I was like, Seriously? Initial report said that Palawan’s world-renowned attraction was bombed, but it wasn’t – quickly correcting by the police. Perhaps what made people think that Palawan was bombed was when they heard an explosion. 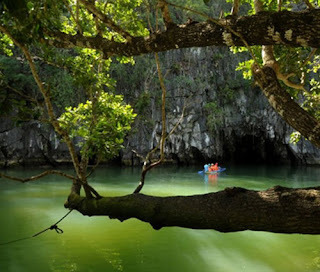 Fortunately the underground river is safe and the explosion heard was the result of experts skillfully detonating the bomb. I would like to commend the vendor who, according to the reports, promptly informed the authorities upon the discovery of the improvised explosive device (IED). Kudos! I don’t clearly understand as to why there are people in the world who enjoy scaring other people, or worst. What do you think should be done to those responsible? Do you think iron fist should be ruled?